Managed IT Services, IT Support and Consulting, Cybersecurity - Potomac, Bethesda, McLean | Ubisec Systems, Inc. The innovators at Ubisec Systems provide next-gen products and dynamic services, because you can’t get ahead with unsecure, slow, and outdated technology. Since 2005, Ubisec Systems has been providing expert managed IT services, stalwart security, and proactive support to businesses in California, Nevada, and Arizona. We’ve continued to grow over the years because we never rest on our laurels, and we always stay abreast of new technological developments in the IT field. By constantly upgrading the technology solutions we provide and honing our services, Ubisec has empowered our clients to thrive and earned their trust. We’ve helped everyone from global enterprises to local nonprofits grow their bottom lines and we’ll do the same for you. Click on each icon to learn more about our proactive, managed services. 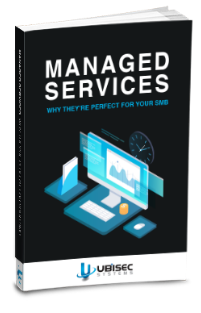 Not clear on the advantages of hiring a Managed Services Provider? Not sure how your business will benefit from proactive maintenance and monitoring of your IT systems? Get more information from our FREE eBook so you can make informed decisions. Just click the link for your copy; no cost, no obligation. Ubisec Systems values cybersecurity – it’s one of our highest priorities. We focus on safeguarding our clients from cybercriminals because we know that without proper countermeasures, all of our other services are meaningless. Our security experts have spent a great deal of effort developing and perfecting our cybersecurity solutions, so much so that we have several governmental clients relying on us to keep their systems and data safe. Partner with Ubisec, and we’ll do the same for your organization. See what they say about Ubisec’s services and solutions.